↑ Catalan and Occitan are the own languages of Catalonia and Aran (respectively) and official languages of the autonomous community of Catalonia according with its Statue of Autonomy. 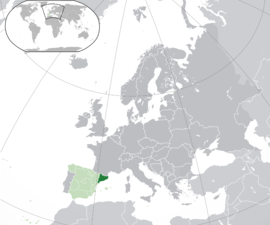 ↑ As "the official language of the State", according with the Spanish Constitution. ↑ ၃.၀ ၃.၁ National Statistics Office (Spain's GDP and GRP), National Statistics Office. GDP Figures of Spanish autonomous communities and provinces 2008–2012.